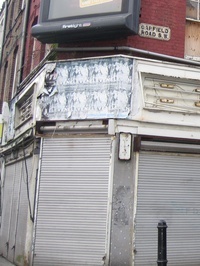 I’ve posted about 19 Lavender Hill, the abandoned, eyesore, building on the corner of Garfield Road on a couple of occasions before and have had plenty of correspondence from residents (both near and far to the building) about it. But it still remains an very obvious blight on the road. In order to provide a brief follow-up the wheels are still, slowly, turning. Having failed – through pressure and incentive – to get the original owners to bring the site back in use the council used its powers of compulsory purchase to buy the building. It as then to be sold on, but because we wanted to ensure the new owners would have not only the ability to renovate and bring the building back into use but would also have the legal obligation to do this quickly the sale was not as straightforward as most property transactions. However, I’ve been told by council officers that there is now a buyer who have a track record of bringing properties like this back into use. They and the council are currently completing the legal side of the sale and (though I am very wary of tempting fate on this) we should see the site smartening up in the early part of next year and back in use by next summer or autumn.